For the record, I definitely think the FDA should have label mandates and testing for toxic chemicals in kids’ face paint especially. Read: “The Scary Truth About Your Kid’s FacePaint” and apply the data not just at Halloween, but at all the festive fairs year round. 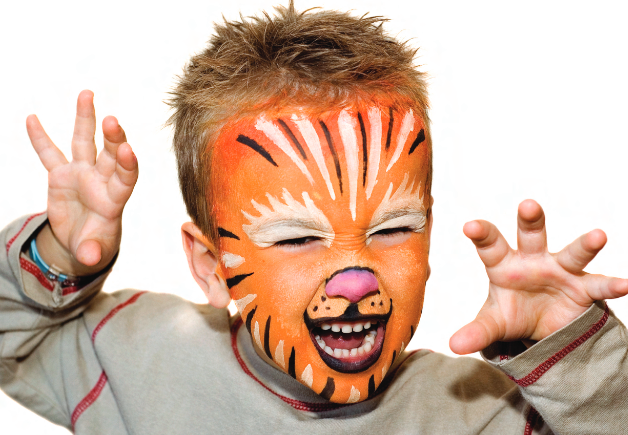 Also, be sure to read Campaign for Safe Cosmetics guidelines, linked in this great EcoChild’sPlay piece, asking “what’s IN your child’s face paint?” Happy Haunting! Original Post: Oct. 31, 2008 Make-up for school? Think again, missy. Well, actually, yah. If it passes the Green Halloween sniff test. Here are some how-tos for using gels, facepaints, eyeliners and lipstick for a quickie transformation to a Franken-face, skeletal nightmare, ghoulish vampire, witch, or more from KidzWorld…But FIRST, check out what toxins you’re putting on your little pumpkin! Consult the Environmental Working Group’s “Skin Deep” database that rates branded products for toxicity! Teens Turning Green has all kinds of treats and tips for you to wear it and wear it well…They’ve expanded from their origins at Search For The Cause (hunting down the high incidents of cancer in women) to an entire Turning Green range of programs that includes mobilization via Teens for Healthy Schools, AND their very own “by teens, for teens” environmentally conscious beauty products. Thanks, you make a good point! I agree , you hope these teen entrepreneurs go green with cash flow and are the envy of all, as they’re smart branding gal pals using the power and potential of media AND marketing to transition teens to a healthier place! A catalyst for change preserving the future of our planet? Educating kids with resources to make a difference? FABulous, dahlings. Thanks for the info, well worth a read. We do tend to put our faith in manufacturers of cosmetic type products without realizing the consequences. Especially when it comes to our children, we should be making every effort to make sure the products are as natural as possible. Well, I agree, and I’m getting better about reading up on same via sites like Eco Child’s Play or SafeMama, etc. in our sidebar…but I’m also the first to admit I’ve turned a blind eye toward ‘oh, they wouldn’t do THAT, would they?’ when it comes to regulatory arms, and have only recently ‘come to the party’ in terms of seeing the profit motive trumping public health, time and time again. sigh. Lots of ‘vested interests’ out there…and lobbyists…and stockholders…etc. etc.— I’m anxious to go to the green teen event 2-6-09 to hear more of what they’re up to…and the research they’ve unearthed. Its quite coincidence I ran across this site. I was just reading last night with my son an essay written by Tom Reagan about “Cosmetic Testing” on animals, specifically rabbits. Where are we with Animal Rights? It was an eye opener for me. 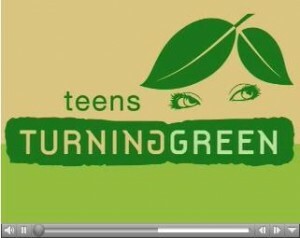 Teens Turning Green has a whole area devoted to that, as does the Campaign for Safe Cosmetics. I refuse to buy ANYthing associated with cosmetics testing on animals…bleh. Turns my tummy.